"All The News You Never Knew You Needed To Know ...Until Now." H/t to ChrisM my MP3Angel for supplying the audio files. «o» Republican presidential contender Herman Cain... the pizza king, has a campaign problem, AKA "woman problems". Apparently there were a couple of women he sexually harassed who got paid off in a court ordered settlement when he was chairman of the National Restaurant Association. There was a non-disclosure clause in that ruling so no one knows who the women are, but expect hard questions when he shows up at the National Press Club today for a press conference. «o» The Statue of Liberty turned 125 years old yesterday and after a gala party, it was closed, probably for the next year, for a retrofit to bring it up to modern structural construction codes. «o» In Afghanistan twelve Americans including seven military "contractors", a Canadian, and a number of Afghanis were killed when a convoy they were traveling in was hit by an IED, and 2 more US soldiers were killed in Kandahar. «o» In Austin Texas the city enacted a new law on Friday night making it illegal to have food tables and then moved to clear part of the #OccupyAustin encampment, ostensibly to pressure wash the area, but no one was leaving and arrests were made. The arrests across the nation continue in small numbers, but if the arrests get much larger, expect a number of cities to go broke due to the cost of police operations and prosecutions. «o» Ireland goes left. The left side of the Irish Labor Party has taken control. It will be a coalition government, but maybe Ireland will set a trend towards international Socialism as a solution to Europe's economic crisis. Meanwhile, in Somalia, the heart of the West's proxy war on the Horn of Africa... where IS the U.N. resolution on the protection of civilians? A Kenyan air strike on a camp packed with displaced women and children killed at least three and wounded scores Sunday in southern Somalia, witnesses and an aid group said. The Kenyan army denied killing civilians and said that its strike had taken out fighters from the Islamist insurgent group Shebab, the main target of its two-week-old military operation in Somalia. Doctors Without Borders said at least three were killed in the air raid on the camp with some 9,000 internally-displaced people and witnesses spoke of up to five victims following a strike residents said was conducted by a Kenyan warplane on the city of Jilib. "Our staff said that around 52 people, all civilians, mostly women and children, had been wounded and that three were dead," Gautam Chapperjee, who heads MSF-Netherlands' Somalia mission, told AFP. He said MSF staff in the region were "treating dozens of injured following an aerial bombardment on the town of Jilib that hit a camp for internally-displaced people at around 1:30 pm (1130 GMT) on Sunday." Oh... I see... Mustn't let the Muslims of the nation feed their own refugees. The solution? Send more Western "aid". WASHINGTON (Reuters) - The U.S. Air Force has been secretly flying drones from a civilian airport in southern Ethiopia as part of an aggressive campaign against al Qaeda affiliates in Somalia and Yemen, the Washington Post reported on Sunday. The paper said in its online edition that Washington has invested millions of dollars to upgrade a remote airfield in Arba Minch from where it was now flying a fleet of Reaper drones that can carry Hellfire missiles and satellite-guided bombs. It quoted the Pentagon as saying the drones had been unarmed and had been used for surveillance and collecting intelligence only but that it would not rule out using them to launch lethal strikes in the future. No one at the Pentagon was immediately available to comment. The Android app I’m Getting Arrested allows users to set up alerts in advance and send them to relatives and lawyers when they are about to be detained. There is a strong technological strain running through Occupy Wall Street, and software developers have been gathering at events in several cities to develop such tools for the demonstrators. One mobile app being developed, Shouty, would allow people to use their phones as radios, amplifying the human microphone at meetings in Zuccotti Park. But the app that has gained the most attention is called I’m Getting Arrested. It allows users to write a message and identify recipients — friends, family, a lawyer — in advance. Then, if they are about to be taken into custody, they can push a button to send a text message blast. Its developer, Jason Van Anden, created it in two days after an acquaintance narrowly avoided an arrest at a demonstration several weeks ago. 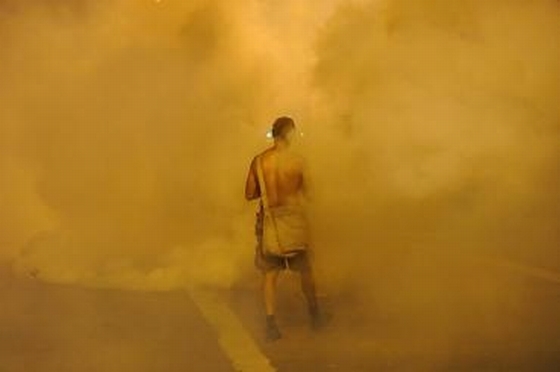 But some people involved in the protests see cellphones as a mixed blessing. One question is whether the police could search the contents of cellphones seized during arrests, allowing them to glean information about the person being arrested or about the movement. Courts in different states have issued conflicting opinions about the rules restricting cellphone searches. The California Supreme Court ruled in January that police officers could examine text messages and other phone data without a warrant during an arrest. In response, legislators passed a bill requiring a warrant, but the bill was vetoed by Gov. Jerry Brown this month. New York’s courts have not ruled on the issue. The Police Department did not immediately respond to questions about its practices on searching phones during arrests. Videos of a youth boot camp instructor forcing children to drink water until they vomit and of instructors yelling at a pre-teen boy carrying a truck tire around his neck have sparked a police investigation of the Pasadena, Calif., operation. "What we're going to try do to is find any of the young people depicted in the videos, their parents, and many of the adults who we saw in the actual video," Pasadena Police Department Deputy Chief Darryl Qualls said. Pasadena City Councilmember Victor Gordo said he found the videos "really disturbing." "The videos are really difficult to watch because these minors who are looking for guidance, whose parents have entrusted these camp operators with their children's lives, appear to be going through a very traumatic experience," he said. The boot camp, Family First Growth Camp, is run by Kelvin "Sgt. Mac" McFarland. The camp's motto is "Family: The gift that lasts forever." Some of the children in the camp are as young as 9 years old. ABC News' phone calls to the camp were not answered, and staff did not reply to an emailed request for comment. William Edwards, who attended the camp, told the Pasadena Star News that harsh treatment was commonplace at the camp and that in 2010, he witnessed an instructor handcuff a girl to a fence and kick dirt on her. Edwards' adoptive mother, Helen Edwards, told the newspaper that children of immigrants and the illiterate were targeted for membership. McFarland was arrested May 16 on suspicion of kidnapping, child abuse, child endangerment, extortion and unlawful use of a badge after he allegedly handcuffed a truant Pasadena Unified School District student and told her parents, who spoke limited English, that if they didn't pay him $100, he would put their daughter in a juvenile detention center. 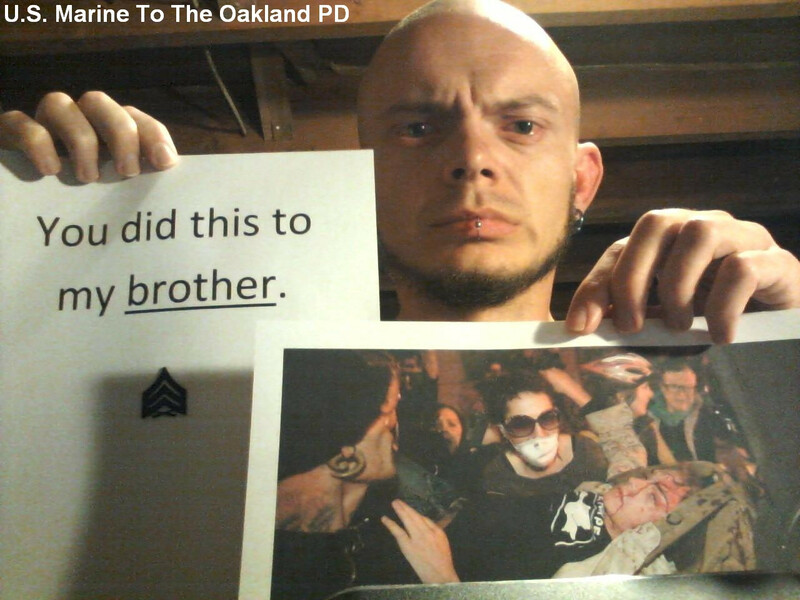 Finally, there is a $5,000 dollar reward being offered to anyone who can identify the officer who shot USMC Marine Veteran Scott Olsen in the face at point blank range with a tear gas cannister at the #OccupyOakland Police Riot last week. This is Razer Raygun saying 'Happy Motoring America...' Enjoy it while you can. Cabale New Service, KPIG Radio, and KVMR radio. In accordance with Title 17 U.S.C. Section 107 and The Berne Convention on Literary and Artistic Works, Article 10, the news clippings, audio, and images used in this posting are made available without profit for research and educational purposes. «o» The #Occupation continues in the Oakland California park across from City Hall after a police riot that left #Occupier Scott Olsen, a two-tour of Iraq US Marine, critically injured after having been struck at point blank range by what appears to have been a tear gas canister. Olsen is now in stable but still critical condition... able to breath on his own and can write but not speak. In the glare of that truly awful global publicity, including a planned march in Egypt's Tahrir Square today in honor of him and massive numbers of people... mostly young people with a baaaasd attitude, streaming to the Oakland protest, the mayor of Oakland is now saying that the police presence will be reduced dramatically and... She supports the protest. Right. That image courtesy of a Reddit posting where there were 600 comments in the first 5 hours, FEW of them friendly to the Oakland police or the city's government. I suspect the "Redditors" were quite busy removing posts that threatened, dast I say "Retribution", from many people including some, like the USMC-Affiliated gentleman above, who count Scott Olsen as a "Brother". Locally, a contingent of Veterans from VFW Bill Motto Post #5888 traveled to Oakland last night to attend the vigil outside the hospital where Scott Olsen is being treated for a skull fracture and about 50 people from #OccupySantaCruz held a candlelight vigil for his speedy recovery in the middle of the main shopping district downtown. «o» Something actually passed the House of Representatives! A bill originating on the president's desk that will cut back the withholding time and payment amounts made by small businesses to the Internal Revenue Service cleared the House yesterday. President Obama has promised that at least one executive order a week until the end of the year designed to hopefully jump start the US economy will leave his desk with a signature. «o» Governor Jerry Brown of California has broached the idea of raising the retirement age for public employees, who are probably the majority of the few people left in California receiving retirement benefits paid by an employer. «o» Expunged... Those "Freedoms they hate us for" - Today is the tenth anniversary of the PATRIOT Act. It removed many of the constitutional protections that Americans have had since the inception of the republic... More in the commentary. What CAN you do to suppress masses of people in uprising around the world who are not presenting an armed resistance to your actions? "Video footage published to YouTube shows Olsen lying prone in front of a line of police. Around 10 people gather around him in an apparent attempt to provide aid, before a police officer throws an explosive device into their midst, scattering the group." "We received a request from a local law enforcement agency to remove YouTube videos of police brutality, which we did not remove. Separately, we received requests from a different local law enforcement agency for removal of videos allegedly defaming law enforcement officials. We did not comply with those requests, which we have categorized in this Report as defamation requests." There has been a call for a GENERAL STRIKE by ALL #Occupiers Starting November 2 with the Oakland General Assembly showing 1,484 in favor, 77 abstentions, 46 disagrees meaning 96.9% approval in response to this tragedy and the police violence in Oakland. The police action HAS NOT permanently dislodged the protesters. They ARE back in the park across from city hall, and the Mayor, who had issued a rather blank statement initially about the actions of the Oakland Police in response to the park encampment is under fire with President Obama having been asked whether he thought that action against non-violent protester is in any way an appropriate response. More about Scott Olsen's condition from the Guardian UK... The world IS watching. An Iraq war veteran has a fractured skull and brain swelling after allegedly being hit by a police projectile. Scott Olsen is in a "critical condition" in Highland hospital in Oakland, a hospital spokesman confirmed. 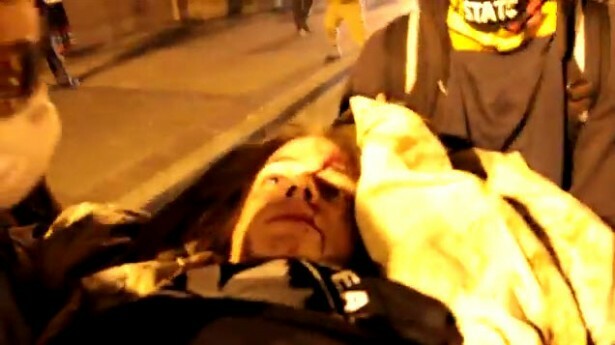 Olsen, 24, suffered the head injury during protests in Oakland on Tuesday evening. More than 15 people were arrested after a crowd gathered to demonstrate against the police operation to clear two Occupy Oakland camps in the early hours of Tuesday morning. Jay Finneburgh, a photographer who was covering the protest, published pictures of Olsen lying on the ground. "This poor guy was right behind me when he was hit in the head with a police projectile. He went down hard and did not get up," Finneburgh wrote. Olsen was taken to Highland by fellow protesters. The Guardian spoke to people with Olsen at the hospital. Adele Carpenter, who knows Olsen through his involvement with anti-war groups, said she arrived at the hospital at 11pm on Tuesday night. Carpenter said she was told by a doctor at the hospital that Olsen had a skull fracture and was in a "serious but stable" condition. She said he had been sedated and was unconscious. "I'm just absolutely devastated that someone who did two tours of Iraq and came home safely is now lying in a US hospital because of the domestic police force," Carpenter said. Olsen had only moved to Oakland in July, Carpenter said. He is a member of Veterans for Peace and Iraq Veterans Against the War, and met Carpenter through her work with the civilian soldier alliance. Keith Shannon, who served with Olsen in Iraq, arrived at the hospital after protesters contacted him through Facebook. He confirmed Olsen had a fractured skull, and said he had been told by a doctor Olsen also had brain swelling. A neurosurgeon was due to assess Olsen to determine if he needed surgery, Shannon said. "It's really hard," Shannon said. "I really wish I had gone out with him instead of staying home last night." Shannon, who is also 24, said he had seen the video footage showing Olsen lying on the floor as a police officer throws an explosive device near him. "It's terrible to go over to Iraq twice and come back injured, and then get injured by the police that are supposed to be protecting us," he said. He said Olsen had served two tours of Iraq, in 2006 and 2007. Olsen was in 3rd Battalion, 4th Marines with Shannon before leaving the military in 2010. He moved to the San Francisco area in July and works for Opswat, a software company, living with Shannon in Daly City, just south of San Francisco. Shannon said Olsen was hit in the head by a tear gas canister or smoke canister shot by a police officer. He said Olsen had a curved scar on his forehead consistent with a canister. Protesters who had accompanied Olsen to Highland hospital got in touch with Shannon through Facebook, after Olsen said he lived with someone called "Keith". Shannon said he was told Olsen was unable to say his surname. Olsen is originally from Wisconsin and some of his family were planning to fly out to California to be with him, Shannon said. Video footage published to YouTube shows Olsen lying prone in front of a line of police. Around 10 people gather around him in an apparent attempt to provide aid, before a police officer throws an explosive device into their midst, scattering the group. Footage captured after the explosion, which appears to be from a flash bang grenade, shows Olsen being carried away by a group of people. «o» In Yemen there has been a mass 'veil burning' by women in Sana'a. This is NOT an idle gesture as the veils not only cover their faces but indicate tribal and clan affiliations. MUCH more in the commentary. «o» With a BANG! The Klamath Native Americans in California have succeeded in legally destroying a dam that had ruined their Salmon fishing grounds. «o» President Obama is pledging to go ahead with the "We Can't Wait" jobs program and is intending to issue a new executive order every week until the end of the year. So far he's issued the orders for mortgage relief, student loans and this week, Veteran hiring, which is very important because as our wars in Iraq and Afghanistan slowly return home, America will have large numbers of ex-soldiers who, in hard times, in a country with no work for them, could easily band together to... You figure it out. «o» The six billion dollars in palletized hundred dollar bills "lost" in Iraq has allegedly been found at the Iraqi central bank. However a Google news search on "six billion dollars lost in Iraq has been found" returns nothing... Perhaps it's been "lost" again. In their attempt to protect pay packages that would shame a Goldman Sachs executive, the CEOs of the biggest military contractors are again releasing bogus "analysis" on job creation related to massive military budgets. Don't be fooled: the spin coming out of the Second To None lobbying front is about one job, and one job only: the job of the guy at the top of the war corporation, along with its massive salary. Let's dispense with the war profiteers' so-called economic analysis (.pdf). The study released today at a war-contractor-convened press conference tries to obscure the massive jobs cost of military spending by citing all the jobs that are tied to the current Pentagon budget. This "analysis," though, is completely context-free, rendering it useless in determining the best course of action for the deficit committee and in making predictions about the economy in general. And the very classlessness of our society makes the conflict more volatile, not less. The echoes of our own Great Recession do not end there. Both parties were alarmed by this motley assemblage and its political rallies; the Secret Service infiltrated its ranks to root out radicals. But a good Communist was hard to find. The men were mostly middle-class, patriotic Americans. They kept their improvised hovels clean and maintained small gardens. Even so, good behavior by the Bonus Army did not prevent the U.S. Army’s hotheaded chief of staff, General Douglas MacArthur, from summoning an overwhelming force to evict it from Pennsylvania Avenue late that July. After assaulting the veterans and thousands of onlookers with tear gas, ­MacArthur’s troops crossed the bridge and burned down the encampment. The general had acted against Hoover’s wishes, but the president expressed satisfaction afterward that the government had dispatched “a mob”—albeit at the cost of killing two of the demonstrators. The public had another take. When graphic newsreels of the riotous mêlée fanned out to the nation’s movie theaters, audiences booed MacArthur and his troops, not the men down on their luck. Even the mining heiress Evalyn Walsh McLean, the owner of the Hope diamond and wife of the proprietor of the Washington Post, professed solidarity with the “mob” that had occupied the nation’s capital. The Great Depression was then nearly three years old, with FDR still in the wings and some of the worst deprivation and unrest yet to come. Three years after our own crash, we do not have the benefit of historical omniscience to know where 2011 is on the time line of America’s deepest bout of economic distress since that era. (The White House, you may recall, rolled out “recovery summer” sixteen months ago.) We don’t know if our current president will end up being viewed more like Hoover or FDR. We don’t know whether Occupy Wall Street and its proliferating satellites will spiral into larger and more violent confrontations, disperse in cold weather, prove a footnote to our narrative, or be the seeds of something big. Too overworked, lack of transportation, or any number of other reasons keeping you from being a star in the social activism world Bubbie? A thousand ways YOU CAN be an activist. Just DO it! It is time for people to become more active politically, socially and culturally. It is not enough to spend your entire life waiting to be entertained by the political rhetoric. The next time you’re with family or friends, discuss a particular cause, instead of letting the conversation drift to celebrity gossip. Be mindful of the fact that the news channels synthesize events in ways which make the individual feel as if activism is hopeless. Try to make friends that are politically involved, instead of maintaining the same old school friends. Stay focused on one particular cause, it’s fine to take up many causes, but always recognize your main cause. Call a big bank that was bailed out in 2008 by the people and ask them if they would be willing to bail out poor families. Go to a protest, do not let the stigma propagated by the mass media keep you away from protests. When your friends talk to you about new consumer products, change the topic to political causes instead. If you’re going to a protest, try to bring as many of your friends as you can. When friends say that protestors are ‘crazy’, explain to them exhilarating feeling of being part of a large politically conscious group. Being an activist requires sacrifice, you will lose many brainwashed friends along the way, but who needs them anyway! Write an open letter to the CEO of a certain company that you dislike and publish the letter online. Write an anonymous letter to anyone who abuses their power, boss, CEO, professor, manager etc. When people use the word consumer to describe human beings, correct them and tell them that human beings are more than consumers. Organize meetings where you can discuss political matters with others who share the same interest. Always persuade people, avoid antagonizing them or their social/corporate defense mechanisms will kick in. Instead of going to watch a mind numbing Hollywood film, look up protests in your area and go to one. Talking to people is the most effective way of short-circuiting the mass media’s control over people’s minds. Learn from the experiences of others, ask a homeless person how and why they became homeless. Volunteer, volunteer, volunteer! Volunteering teaches you that human actions do not have to always be about financial rewards. Instead of going to a nightclub or a party to meet other people, go to a protest. Parents will always question political activism, do not let it bother you. 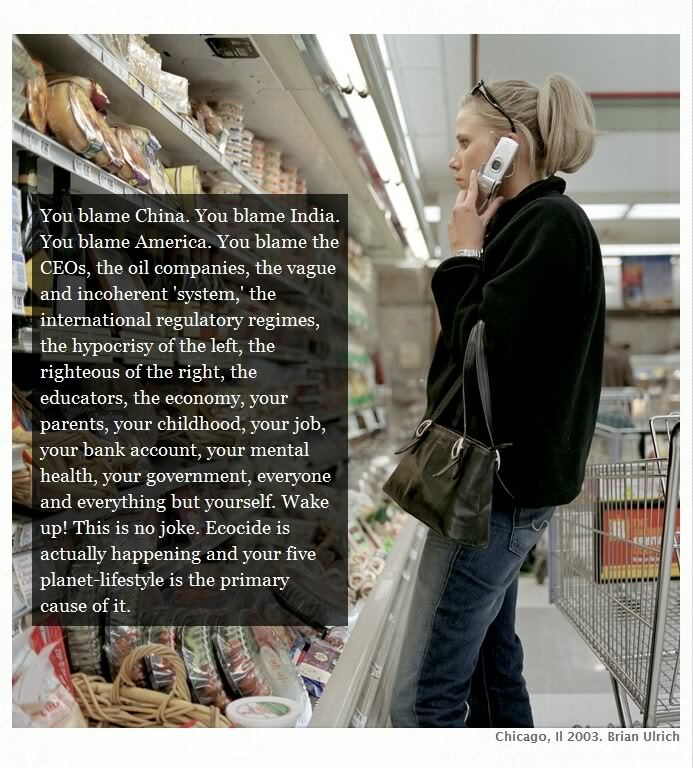 Try seeing how long you can go without purchasing anything barring food of course, to test your consumerist drive. Do not get ahead of yourself with thoughts of changing the world, change your life first and the lives of those around you. Avoid feelings of apathy that follow political disappointments, instead, set a new goal and work on it. Organize a group of four or five people and help each other go to protests. Do not antagonize the police, that’s counterintuitive, and it allows the capitalist force to activate its violent drive. Ask a police officer if he or she are part of the upper class, the ruling elites. Ask a police officer why they protect the bankers and capitalists which keep all of our children in debt. Write an open letter to a billionaire asking them why they love money to the point of forgetting about starving human beings. Find a political magazine or blog and write for them. The next time you visit a store like Wal-Mart, ask a worker how they feel about lacking a union and basic worker rights. Go to the shopping mall and buy absolutely nothing, instead go there with the purpose of talking to workers about their exploitation. The next time you see a friend with a brand name item, ask them how much the workers who made it get paid? Start a blog to fight against a particular injustice. ['Because I feel like I owe it to someone...' After the commentary Crosby Stills Nash & Young ALMOST cut their hair. Courtesy of the respective artists. "Though we may be bloodied, we are even more determined to keep going. As we agreed upon in General Assembly, on the evening following any police assault on our camp, we will reconvening at the Oakland Public Library, on the steps. We will discuss our options and pick one, and then take action as a community to respond..."
«o» Perhaps the only worse place to fight over holding ground would be Afghanistan - There was a showdown last night between a thousands protesters and a variety of police agencies in a park across from Oakland California city hall in an attempt to Re-#OccupyOakland. The battle went on for several hours with the police using massive amounts of tear gas flash-bang grenades and other tactical weapons. There are still a few people from the protest nearby and the protesters WILL return today when the park opens for it's "theoretically regular operating hours". Being a US Marine Veteran who served 2 tours in Iraq doesn't count for much when you're with a group of UNARMED protesters attacked by the police for... Illegal Camping. A Marine veteran at Occupy Oakland was injured Monday night after being shot at point-blank range with bean bags or rubber bullets by police. Scott Olsen was at 14th Street and Broadway when he was shot by either San Francisco Sheriffs deputies or Palo Alto Police, according to RT. As Olsen is carried away, he appears unconscious and bloody, unable to even respond when asked his name. OAKLAND -- Police fired tear gas at least five times Tuesday night into a crowd of several hundred protesters backing the Occupy movement who unsuccessfully tried to retake an encampment outside Oakland City Hall that officers had cleared away more than 12 hours earlier. Police gave repeated warnings to protesters to disperse from the entrance to Frank Ogawa Plaza at 14th Street and Broadway before firing several tear gas canisters into the crowd at about 7:45 p.m. Police had announced over a loudspeaker that those who refused to leave could be targeted by "chemical agents." Protesters scattered in both directions on Broadway as the tear gas canisters and several flash-bang grenades went off. Regrouping, protesters tried to help one another and offered each other eye drops. «o» The first fruits from the 'Arab Spring' - There will be a coalition government now that the Tunisian elections are finished and an apparently moderate religious based party previously outlawed by the government has taken about 27 of 50 seats. «o» President Obama is in Colorado today wrapping up his three day "We Can't Wait" tour for a new job bill. He plans to speak about student loans and education, and expect some executive orders in regard to student loan coverage. October 25 2011 Travus T. Hipp Morning News & Commentary: A 1/2 MILLION Dollars To Arrest 150+- Occupy Protesters - Can A Police State Afford Itself? October 25 2011 Travus T. Hipp Morning News & Commentary: At Least 1/2 MILLION Dollars To Simply Arrest 150+- #Occupy Protesters - Can A Police State Afford Itself? «o» President Obama is going to be in San Francisco today pitching his "We Can't Wait" job program. Every security apparat in the Bay area will be working overtime so if you were planning to go downtown... Why don't you go tomorrow instead? «o» In Oakland California the police moved on #OccupyOakland early in the AM today and made mass arrests. Apparently it took the Oakland police, Alameda county sheriffs, San Leandro police, Berkeley police, Walnut creek, AND the California Highway Patrol to clear one city square and a couple of smaller downtown encampments. Oakland is already broke beyond all belief... Who's going to pay the overtime? Much much more in the commentary! Late last night, Oakland police, under orders from the city, began surrounding the Occupy Oakland encampment in preparation to oust the protesters from Frank Ogawa Plaza. In the meantime, in between time, It IS NOT over! OCCUPY OAKLAND: URGENT CALL FOR ASSISTANCE. WE ARE ASKING EVERYONE IN OAKLAND TO JOIN US. Last night we faced an absolutely brutal assault by an army of the Oakland Police (with the help of cops from all over Northern California). Tear gas and flash bangs were fired into the camp where children were sleeping, people were beaten and shot with rubber bullets. The assault was also levied against our property in the camp, and the cops tried their best to completely destroy everything we had there. Almost every tent has been destroyed, many slashed with boxcutters, structures smashed, basically this was not an eviction, they came in to destroy everything we had. After they flattened our main camp, they also went to our small camp in Snow Park and repeated the process there. Though we may be bloodied, we are even more determined to keep going. As we agreed upon in General Assembly, on the evening following any police assault on our camp, we will reconvening at the Oakland Public Library, on the steps. We will discuss our options and pick one, and then take action as a community to respond / rebuild our occupation. This is a big deal, we need everyone and their mother to come out, to help us reestablish and recommit to the occupation. They will not stop us. We will overcome this attack and emerge even stronger. «o» Muammar al-Gadaffi, his son, and the Libyan Defense Minister have allegedly been buried at a secret location in the Sahara desert by the CIA-fronted al-Qaeda affiliated 'rebels' after being on display in a meat locker for the last 3 days. Libyan National Transitional Council official Abdel Majid Mlegta reported to Reuters that the burial process for Muammar al-Qaddafi and his son, Mo'tassim, has begun. Qaddafi's personal cleric read final prayers, and two "trusted people" are taking them from Misrata, where the bodies had been on display in a freezer, to "somewhere very far away in the desert." Other NTC officials claim that Qaddafi, his son, and former Defense Minister Abu Bakr Younis had been buried at dawn. The location will not be disclosed so the site cannot be memorialized. The burial had been delayed amid speculations by international groups who called for an investigation into the circumstances surrounding Qaddafi's death. The NTC reported that Qaddafi's only remaining living son and assumed heir, Saif al-Islam, is planning to escape from the southern Libyan desert into Niger or Algeria. Now who's going to do what for whom becomes the issue as the US Secretary of Defense denies any current plans for a military relationship... Meaning military aid, training assistance, and US basing in the country. Right. «o» A federal court has overturned a Florida law requiring drug tests for people seeking social assistance from the state. There are some seven other states with plans for similar laws. At somewhere around sixty five dollars per screening, you can bet the medical laboratory lobbies would love to ram this ruling into a higher court, or work on a rewrite that would pass federal muster. «o» We're pulling out but leaving the 'condom' after screwing Iraq. There will be about 40,000 troops stationed in the immediate area with 20,000 troops right next door in Kuwait. «o» You thought that since it's your money you can do as you like with it as long as it's legal? Think again. Wikileaks is under financial pressure and may stop publishing on their site due to being locked out by all major financial institutions that donators would send payments through. MasterCard, Visa, and all the major banks and financial institutions are refusing to process payment for the organization, but the leaks undoubtedly WILL continue even if their site goes dark. Rick Perry’s unveiling of a flat tax plan today in South Carolina is the latest piece of evidence that the Texas governor is trying to push the “reset” button on a presidential campaign that has faltered badly after a strong start. Perry’s economic speech comes on the same day his campaign is reportedly set to launch its first ads in Iowa and just 24 hours after news broke that he was expanding his political team to include a trio of veterans of Florida Gov. Rick Scott’s (R) 2010 campaign, as well as George W. Bush loyalist Joe Allbaugh. Movement doesn’t always equal progress, but Perry and his (now-expanded) political team are clearly hoping to use the next three debate-free weeks to re-write the prevailing “Perry is fading” narrative of the campaign. The Reset Button is a document, a movement, a strategic plan, and a call to immediate action to US citizens that want to control their own governance and thus their destiny. Then, The Reset Button defines more than a dozen critical areas of change that support the majority (US citizens) rather than corporations and banks. The action (specific financial pressure on major corporations - including complete divestment and boycotts - plus simultaneous demonstrations in all 50 State capitals) has never been done before. The goals of The Reset Button are divided into two phases: Phase I is fully articulated in the legal language and format of a single proposed US Constitutional amendment – Amendment XXVIII (Election Reform Amendment), and one law – the Election Reform Act of 2011. Success with Phase I will mean that the citizens of the US actually have control over elections, and that ordinary citizens will become elected by citizens, not selected by corporations. Phase I mandates that candidates will be required to address Phase II items in written position papers. Phase II currently outlines major areas of critical importance to US citizens, and will be drawn-up into the legal format of congressional acts and constitutional amendments in time for debate and mandated position papers by candidates, prior to the 2012 election. Phase II Acts and Amendments - written by citizens, not lobbyists or corporations - will be considered as a blueprint for change for the newly elected officials in 2012. No incumbency and no seniority. Every elected and appointed office term is four years. Every four years, the slate is wiped clean. All previous elected and appointed officials depart; all new elected and appointed officials enter. No individual may ever serve more than four years in any office. Judges and justices, including Supreme Court and other Federal judgeships, are retired as of the 2012 election, and future judges and justices conform to the same four year term and cycle as any other elected or appointed official. Collusion is legally equated with treason. Corporate personhood is formally eliminated. No citizens with dual citizenship may hold office. Candidates for office and appointees must not be a corporate board member or stockholder in any corporation. Elected and appointed officials agree not to participate in corporate boards, banks, or stock/commodities trading firms for five years after leaving office. Candidates must pass a new Civil Service Exam. Federal judges/justices must have passed a law bar exam. Only public money (including the nominal filing fees from candidates) may be used for elections. No corporate or outside money - not even from candidates - may be used. Candidates must meet all criteria and pay a nominal filing fee. To get to a reasonable number of final candidates, the entire candidate field for each office is physically randomized in a hopper, and a specific number of names are drawn. Final candidates are all given equal amount of public funding, must publicly account for expenditures, and are mandated to be given equal time and prominence in all media. Mandated debates and mandated position papers present individual candidate views. All voting to be on paper ballots and hand counted. Vote of Confidence by Citizen Initiative provides a method of elected official recall and even 'freezing' elected official duties, and provides this uniformly from local to federal elected officials, including judges and the president. Please do not make the mistake of thinking that you have read The Reset Button document, if you only read the executive summary. Ready to "Punch the button and punch them out"? October 24 2011 Travus T. Hipp Morning News & Commentary: Haven't You Heard? The War Is Over! How Come You Aren't Dancing In The Streets? «o» Have you heard? The war on Iraq is "Over" on the first of next year! How come Americans aren't dancing in the streets and soldiers cavorting with the girls? Because many of those soldiers are going to be moved right next door to Kuwait, awaiting a renewal of hostilities, or perhaps to be re-deployed to Afghanistan to lay waste to that beleaguered nation before we're forced out of that country as well. Then MAYBE, we'll engage in a war against Afghanistan AND Pakistan in the near future. Afghan President Hamid Karzai told Pakistan's Geo Television in an interview aired on Saturday that Afghanistan would support Pakistan if it were to go to war with the United States, or any other nation, calling Afghanistan "a brother" to Pakistan (Reuters, NYT, AP, WSJ, Guardian). The interview sparked a wave of criticism from many Afghans, particularly in the north if the country, who believe that Pakistan is responsible for much of their ongoing struggle with militancy. It is unclear when the interview was recorded, but its broadcast came just after U.S. Secretary of State Hillary Clinton left Pakistan, where she pushed the government to facilitate reconciliation in Afghanistan, while at the same time pressing Pakistan to take more action against insurgents (AP, LAT, Post, Reuters). The reason for the pullout from Iraq? US citizens will no longer be immune from prosecution under Iraqi law, and that includes military personnel. But our troop removal, advertised (choice of word intentional) by president Obama as 'forced' by Iraqi decree has some Withdrawal Symptoms, and "Cold Turkey" IS NOT what Doctor Strangelove ordered. Barack Obama has announced that all American troops will be withdrawn from Iraq by the end of the year. This was presented as America honorably adhering to the agreement signed years ago by the Bush Administration. At the same time, White House and Pentagon spinners were planting stories to make clear that the United States had fully intended to continue its military presence in Iraq past the deadline, but was thwarted by the Iraqis' unconscionable refusal to allow American forces to commit crimes with impunity -- and immunity -- on Iraqi soil. These backroom "process" stories -- filled, as always, with unnamed insiders providing savvy "nuance" -- were detailed, laying out a long series of negotiations, ending in what was clearly the Americans' chief goal: a military presence of 3,000-5,000 troops, placed strategically around the country, with a main focus in Baghdad. These negotiations failed; hence Obama's announcement that he was being forced to honor the existing agreement on withdrawal. At the same time, however, we are also told that the State Department will maintain "at least" 5,000 armed "security personnel" -- mercenaries of various stripes. These 5,000 militarized (if not officially military) troops will be stationed in strategic locations around the country, where the United States will establish mini-fortress "consulates" in Iraqi cities, with a main focus in Baghdad. So the Americans had a baseline goal of 3,000 armed personnel remaining in Iraq; they will now have a minimum of 5,000 armed personnel remaining in Iraq. It could be argued that the original intent was to have the 3,000-5,000 uniformed troops in addition to the 5,000 mercenaries, and thus the Americans have taken a bit of a haircut in the occupation department: 5,000 instead of combined total of 8,000 (or a top end of 10,000.) Maybe so. But the fact remains that whatever else happens, the American government will have a minimum of 5,000 men under arms, stationed all across the conquered land. What's more, there is apparently no limit on the number of such mercenaries the Americans can employ to provide "security" for the thousands of other American government operatives who will remain. Any number of pretexts could provide excuses for a "surge" in "security contractors": 8,000, 10,000, 20,000 -- who's to say how many will ultimately be "needed" to combat "terrorists"? "The Wikileaks Iraq war logs provide us with a unique picture of every death in Iraq. These are those events mapped using Google Fusion tables." When the Hand Cursor points at a red dot, click once for the specifics of that particular death. «o» The Senate is in recess and will apparently work on "Job Bill II" when they return. Meanwhile the president is using that time to take a three day tour of the Western United States, Nevada, California, and Colorado, to announce his backup plan for the rapidly failing job bill which will be executive actions such as a loosening of loan requirements for individuals to refinance on their failing mortgages and he may also find a way to repair highways under executive privilege. More at Reuters. «o» There has been a Richter 7.5 (7.2?) earthquake in Eastern Turkey which has razed the provincial capital of Van and towns nearby. It happened at lunchtime. Several hundred are known dead so far and more than a thousand people have been injured in a land where "ReBar" is only a rumor. The quake also forced hundreds of thousands of people to spend a cold, sleepless night out in the open. «o» The heir apparent to the Saudi throne, Crown Prince Sultan bin Abdul Aziz has died at 83. He was a pivotal member of the royal family involved in the matters of the kingdom and it's unclear who will replace him. Bloomberg on that. NOW he's talking like a Republican! Last week in Las Vegas, Paul put forth his plan to slash $1 trillion from the federal budget by ending the departments of Energy, Education, Housing and Urban Development, Commerce and Interior. The Environmental Protection Agency, Food and Drug Administration and Department of Defense would also see deep cuts." 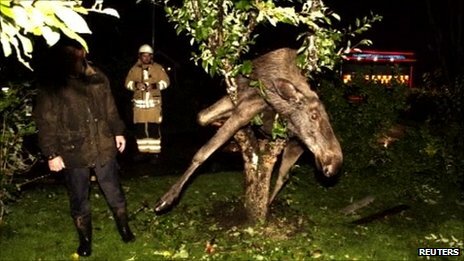 Meanwhile, in Sweden, "Drunk elk found in apple tree near Gothenburg"
A homeowner in southern Sweden got a shock when he found a drunken elk stuck in his neighbour's apple tree. The animal was apparently on the hunt for fermenting apples when she lost her balance and became trapped in the tree. Per Johansson, from Saro near Gothenburg, found the elk making a roaring noise in the garden next door. He called the emergency services, who helped him free the boozed-up beast by sawing off branches. She spent the night recovering in the garden. The next day she took herself off into the woods with her hangover. It is not unusual to see elk, or moose as they are known in North America, drunk in Sweden during autumn, when there are plenty of apples about. Other residents of Saro had seen the elk on the loose in the preceding days. What #Occupy IS REALLY about. America's "Five Planet Lifestyle", and American "Exceptional" rationalizations and denials that allow us to go about blithely destroying the planet we live on without an apparent care in the world. Hi! I'm Razer Raygun. Welcome to Razed By Wolves, Just another BloggerBlog consisting of news and other media about local, national, and global events, and the people who, by their actions and words, create those events, making the world around us a more dangerous, nastier place to live. Also be sure to visit our companion blog, Auntie Imperial's News & Blog Review. She's a MEAN one! I B Bad. I'm The 897,186,093 Richest Person On Earth! Discover how rich you are Here!